View your contacts, companies, deals, or tickets that have specific characteristics. 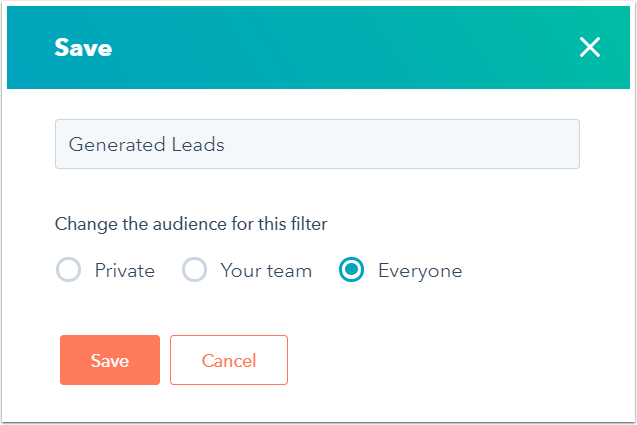 Custom saved filters allow you to quickly and easily see which contacts, companies, deals, or tickets meet the criteria you've set at any given time. In your HubSpot account, navigate to your contacts, companies, deals, tickets, or prospects. In the left sidebar menu, click add Add filter. Search for the property you want to use in your filter. Select the criteria you want to use in the filter. Once you've added your criteria, click Apply filter. To create a filter that contains a unique string of characters, add an asterisk (i.e., "*") as a wildcard character. For example, to filter contacts with an email that starts with admin, select contains exactly and enter admin*. To filter email addresses with a specific domain, use the Email Domain property instead of a wildcard character. Add more properties to your filter. Once you're done, click Save. In the dialog box, enter a name for the saved filter and select the audience for the saved filter. Then, click Save. To use this filter going forwards, click All saved filters from the relevant objects dashboard and select the name of the saved filter. In the left sidebar menu, click All saved filters and select the name of the saved filter to customize. In the upper right, click the Customize dropdown menu and select Edit columns. Select a property to add it to the Selected columns section. 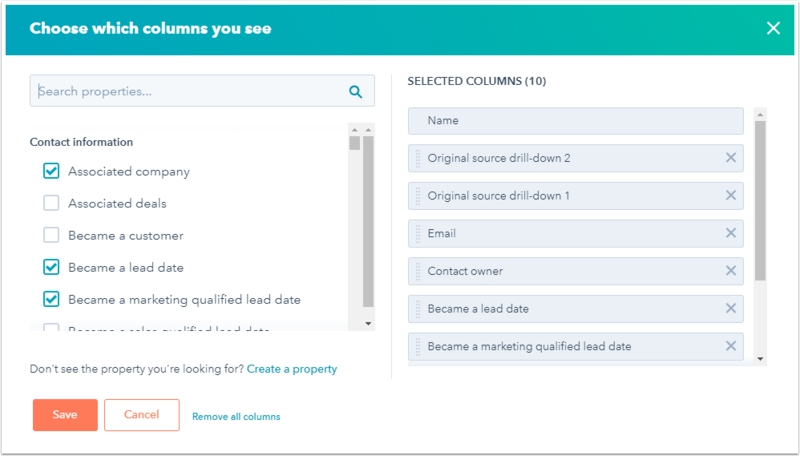 In the Selected columns section, click and drag properties to rearrange them. Add to favorites: pin the saved filter to the left sidebar menu for easy access. 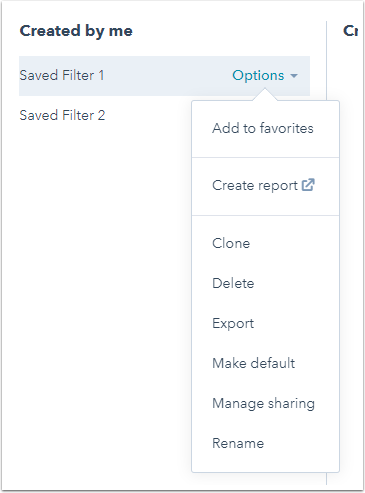 Create report: create a report based on the segmentation of the current saved filter. Clone: clone the current saved filter. Delete: delete the current saved filter and remove it from your All saved filters screen. Export: export a CSV file of the contacts in the current saved filter. Make default: set the current saved filter as the default when you navigate to Contacts. Manage sharing: change the filter's audience. Rename: edit the name of the current saved filter.